Trying to account for all your employee’s work hours can be difficult, especially if they need to make any changes to a schedule that you’ve already made. 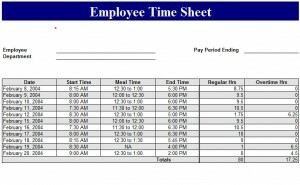 The Employee Time Sheet Template is a fast and convenient way to keep track of all this information, and store it for any unforeseen edits that may occur. We know you’re busy, that’s why this time sheet can save you all the unnecessary hassle. Simply download the file below and select an easily accessible location on your computer. Click on the file to open the template. When you have the file open, you can see how simple the Time Sheet will make your day, just fill out the blank spaces, or have an employee fill them out, and you’ll be ready to start your work! The template is designed to conveniently list all the necessary details for your employee and the hours they worked, such as: the date, their start time, lunch, end time, and the total number of hours. There is even a column for overtime, if applicable to your business or non-profit organization. For organizing, there is a section at the top of the page to write down what pay period these particular hours apply to and a space for your employee’s name and department. This way, you can easily find and keep track of employee hours for that pay period. Once all of the information has been properly formatted to suit your organization, you are ready to print the document by clicking “File” in the top left corner of the page, and then selecting “Print”. You can also keep everything digital by safely keeping it stored on your computer. Simple design allows you to customize the template quickly. Conveniently displays organizational information at the top. Calculates totals so you don’t have to!